The Meaning of Ascension. Audio Homily. Synopsis: Because Jesus Christ took on our flesh in every way, His ascension tells us that we will ascend in the flesh. This will be accomplished by living according the the Holy Spirit, Who was promised to us after His ascension. St Ephrem the Syrian on the Ascension. St Athanasius explains the Psalms referring to the Ascension. Do you see then to what height of glory human nature has been raised? Is it not from earth to heaven? Is it not from corruption to incorruption? How hard would not someone toil in order to become the intimate friend of a corruptible king here below? But we, although we were alienated and hostile in our intent by evil deeds, have not only been reconciled to God the Father, through our Lord Jesus Christ, but we have also soared aloft to sonship, and now our nature is worshipped in the heavens by every creature seen and unseen. On this account it foretells his bodily ascension into heaven, and says in Psalm 23, "Lift up your gates, you princes and be lifted up, you everlasting doors, and the king of glory shall come in." And in the forty-sixth, "God is gone up with a shout, the Lord with a sound of a trumpet." It announces the session at God's right hand, and says in Psalm 109, "The Lord said to my Lord, Sit on my right hand until I make your enemies your footstool." Ascension – 11 questions and answers, and The whole of our faith is Jesus Christ. Two prophesies, one fulfilled, one being fulfilled. hat significance does the event of the Ascension of Jesus Christ have for the Christian? We should understand why we celebrate any feast, and its inner meaning. In the gospel reading for liturgy on the Ascension, two gifts are mentioned by Christ. One is given and one is promised. What are they? Comment on their importance and meaning for a Christian. What mountain did Christ ascend from? How will this mountain be involved in another, cataclysmic event? There is a significant occurrence in the Ascension story that can only be understood in the context of the church, and the absolute need for apostolic succession of bishops and priests. This occurrence, properly understood, should cause everyone who trusts his own interpretation of the bible outside of the context of a visible, authoritative and dogmatic church to flee from his false, individual understanding and seek out the church. What is this occurrence? Comment on it, and try to specify other scriptures which point out or support this critical Christian teaching. … and more questions and answers. Ascension of Christ. 11 Questions and Answers. QUESTION 1. What significance does the event of the Ascension of Jesus Christ have for the Christian? We should understand why we celebrate any feast, and its inner meaning. Christ ascended to Heaven as man and as God. Once he became a man, being at the same time, as always, perfect God, he never put off His manhood, but deified it, and made it and us capable of apprehending heavenly things. 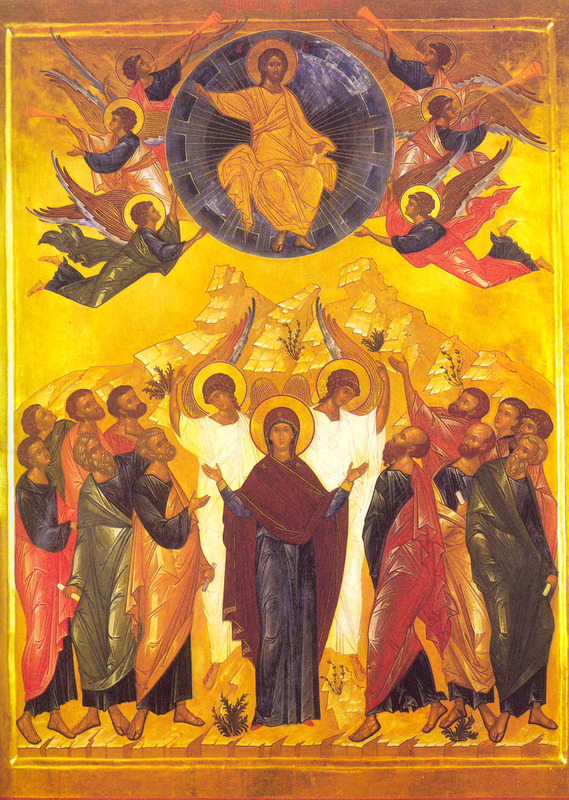 The Ascension is a prophecy of things to come for those who love God and believe in Him in an Orthodox manner. Those who believe and live according to this belief will be in the heavens, in the flesh, with Him, just as He now abides in the Heavens in the flesh. Our flesh and souls will be saved, because Christ made human flesh capable of deification. What Christ has done for human flesh and our souls is impossible to understand, but the church, with sweet melody, meditates with fervor and thanksgiving and precise theology in her services. Since the disciples were "filled with great joy", we who are Orthodox in belief and way of life should naturally be this way also, and should hasten to the temple. There we can meditate upon the magnificent truths and promises in the ascension by listening carefully to the divinely inspired theology, sung in sweet melody. If we pray with care, and expectation, having valued divine worship above our worldly cares, surely God will enlighten us and noetically teach us the true meaning of Christ's Ascension. QUESTION 2. There is an important account of the Ascension in the scriptures that is not in the Gospels. Where is it? The story involves angels. How? Describe how a cloud was involved. QUESTION 3. In the gospel reading for liturgy on the Ascension, two gifts are mentioned by Christ. One is given and one is promised. What are they? Comment on their importance and meaning for a Christian. "Peace be unto you." (Luke 24:36). This peace is not a worldly peace, but is the gift of God, and the attainment of it is the purpose of our life. The only way to understand this peace is to live the Christian life and be changed. It is freely given, but not freely received – not until a man is purified by intense effort, war against his passions, and desire to fulfill the will of God. "And, behold, I send the promise of my Father upon you: but tarry ye in the city of Jerusalem, until ye be endued with power from on high." (Luke 24:49). This, of course, is the promise of the gift of the Holy Spirit, to be given only ten days later, on Pentecost. The ministry of the Holy Spirit is so profound, it cannot be described adequately. He convicts concerning sin and righteousness, He gives strength, He gives wisdom, and the words to say when being persecuted. Ignorant and weak fisherman and all those who make an abode for Him wax bold in their witness of the gospel. He guides the church, and enlightens every man concerning the truth. Without Him, the Christian life cannot be lived. QUESTION 4. What mountain did Christ ascend from? How will this mountain be involved in another, cataclysmic event? Christ ascended by the Mount of Olives. "Then returned they unto Jerusalem from the mount called Olivet, which is from Jerusalem a Sabbath day's journey." (Luke 1:12). Holy tradition understands that Christ will come to judge the world at the culmination of all things "from the East" over this very same mountain. QUESTION 5. There is a significant occurrence in the Ascension story that can only be understood in the context of the church, and the absolute need for apostolic succession of bishops and priests. This occurrence, properly understood, should cause everyone who trusts his own interpretation of the bible outside of the context of a visible, authoritative and dogmatic church to flee from his false, individual understanding and seek out the church. QUESTION 6. When is Ascension celebrated? Ascension is always on a Thursday, exactly forty days after Pascha, just like it occurred in the Scriptures. The Jewish (and Orthodox) way of reckoning days is to count the first and last days. So, Pascha is the first day, and Ascension Thursday, in the 6th week after Pascha, is the Fortieth day. In the same way, Christ was in the tomb three days, although not even one and a half days in terms of hours. Good Friday, the first day, He was buried in the late afternoon. The second day, Saturday, His body lay in the tomb the entire day, then at some point in the very early hours of the third day, He rose from the dead. QUESTION 7. What commemoration is the day before Ascension? Explain. The Apodosis of Pascha is celebrated on the Wednesday before Ascension Thursday (according to the Russian Typicon). All Great Orthodox feasts, according to the Jewish model, have three phases. There is a preparation phase, which may be very long. The preparation for Pascha is the whole of Great Lent, and especially Holy Week. Great Feasts such as Theophany and Nativity have pre-festal Vesperal divine liturgies served the day before. Many feasts are preceded with certain hymns, such as the katavasia of the matins canon, sung for a period before a feast. The feast itself is the ultimate celebration, and then there is a post-festal period, where the truths of the celebration are meditated upon at length in the services. For Pascha, this period is forty days, and ends on the "Apodosis", or "leave-taking" of the feast, on the Wednesday before Ascension. QUESTION 8. How long is the feast of the Ascension? 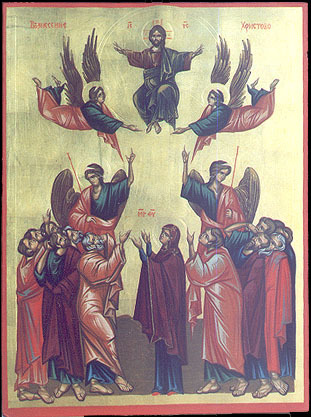 The feast of the Ascension lasts until the Friday before Pentecost, when its Apodosis occurs. This makes perfect sense, as we are waiting for Pentecost, just as the disciples were waiting for the coming of the Holy Spirit, Whom Jesus promised would come to them. QUESTION 9. What, in general terms, is the Typicon for the services of the Ascension? List all the books needed to serve the services completely. Where may one obtain the main texts for the Ascension in English? One the eve of the Ascension, Wednesday evening, an All Night vigil is served. This is a service which combines Great Vespers, Litya, Matins and the First Hour, with slight changes to the beginning and end of Great Vespers and Matins from their form when they are served alone. The "rank" of commemoration is "Vigil" The rank indicates somewhat the importance of the feast, and how much the regular formats for vespers and matins will be modified. Two other "ranks" are "single commemoration" and "double commemoration". On Thursday morning, the Third and Sixth hours and Divine Liturgy are served. To serve the Great vespers, Litya, matins, the hours, and Divine liturgy the following service books are needed. The Apostolos – for the epistle reading at liturgy. Gospel – read in matins and the liturgy. The Pentecostarion – texts for the feast, such as the stichera at Lord I have cried, the Aposticha, the matins canon, etc. The priest's liturgikon – used by the priest for services like vespers, matins, Compline, the midnight office, the hours and divine liturgy. QUESTION 10. Detail the differences between the services of the Ascension and those of a "regular" Sunday. Both have ten stichera at Lord I have cried. All of the stichera for the Ascension are about the feast, as is the case for all "great feasts of the Lord". For "regular" Saturday night vespers, there are at most 7 stichera about the Resurrection (sometimes 6, sometimes 4), with the rest being concerned with a Saint(s) or another event At the end of the Lord I have cried stichera, for the Ascension, "Glory … Both Now …" is sung all at once, and one sticheron, about the feast, is sung. In a regular Sunday vigil, there are usually two stichera here, the first one preceded by "Glory to the Father and the son and the Holy Spirit", the second being preceded by "Both now and ever, and to the ages of ages, amen". The second Sticheron is a "Theotokion", which is about the Theotokos and the incarnation. Three OT readings are read for the Ascension. OT readings are not read in most Sunday vigil services. At the end of vespers for the Ascension, the troparion of the feast is sung three times (this is just before the blessing of the loaves, wheat, wine and oil). In regular vespers, "O Theotokos and virgin rejoice" is sung three times. The Ascension matins has the "Polyeleos", followed by the "magnification" (the latter is in Russian usage only), whereas a regular Sunday matins usually has in stead of the Polyeleos, the 118th kathisma (known as "the blameless"), and there is no magnification. Just before the praises, on Sunday, an expostilarion, "Holy is the Lord our God", is sung. This hymn is omitted on the Ascension. The Ascension liturgy replaces the regular antiphons with festal ones. QUESTION 11. Detail the differences between the services of the Ascension and those of a "regular" weekday. On a "regular" weekday", vespers is served on the eve, and matins in the morning, and no vigil service is sung, as there is for Ascension, Sundays, and most great feasts of the Lord (Pascha being a special exception). Daily vespers, which is usually served on a weekday is a far simpler service than Great Vespers, with no small entrance, "O Gladsome light" being chanted instead of being sung, and less "Lord I have cried" stichera (there are usually 6). In addition, the last two litanies of both vespers and matins are reverses (read in a different order), and the first two petitions of the second litany in regular (daily) vespers and matins are omitted. There are numerous other differences, because daily services are much simpler and shorter. Here are a few, off the top of my head. No litya at the end of a daily vespers. No gospel, "Save O God" intercession at a daily matins. That is enough for now. The best place to understand these services and their differences is to study the service books and chant or sing in the chanters stand. This document is a list of ten (more or less) questions & answers about a particular topic. More “Questions and Answers” topics may be found at http://www.orthodox.net/questions. They are also posted to the blog of St Nicholas Orthodox Church, McKinney Texas, called “Redeeming the Time” – http://www.orthodox.net/redeemingthetime. Use anything you wish, but please indicate authorship, with the URL. When the day of the Jewish Pentecost drew near, the disciples of Christ returned from Galilee to Jerusalem. On the fortieth day after the resurrection of Jesus Christ, they were all together in one house. Jesus Christ appeared to them and spoke with them saying, "Thus it is written that the Christ should suffer and on the third day rise from the dead, and that repentance and forgiveness of sins should be preached in His name to all nations beginning from Jerusalem. You are witnesses of these things. Go into all the world and preach the Gospel to all creation. He, who believes and is baptized, will be saved, but he, who does not believe, will be condemned. And these signs accompanies those who believe: in My name they will cast out demons; they will speak in new tongues; they will pick up serpents, and if they drink any deadly thing, it will not hurt them; they will lay their hands on the sick, and they will recover." Then, the Saviour said to the disciples that soon the Holy Spirit would come upon them, and until that time He charged them not to depart from Jerusalem. He said, "I send the promise of My Father upon you; but stay in the city until you are clothed with power from on high; for John baptized with water; but before many days, you shall be baptized with the Holy Spirit." Conversing with the disciples, the Saviour led them out of the city as far as Bethany to the Mount of Olives. The disciples, overjoyed with the words of the Saviour, surrounded Him and started to ask, "Lord, will You at this time restore the kingdom to Israel?" The Saviour said to them, "It is not for you to know the times or seasons which the Father has fixed by His own authority. But you shall receive power when the Holy Spirit has come upon you; and you shall be My witnesses in Jerusalem and in all Judea and Samaria and to the end of the earth." When He had said this, Jesus Christ lifted up His hands and blessed His disciples. While He blessed them, He parted from them, and He was lifted up to Heaven; and soon, a cloud took Him out of their sight. Thus our Lord and Saviour Jesus Christ ascended in His physical body to Heaven and sat down at the right Hand of God the Father. His human soul and body took on the indivisible glory with His divinity. In His divinity, He always is and will be in Heaven and everywhere. The disciples worshipped the ascended Lord and for a long time continued to stand and gaze into Heaven after Him. Then, two angels in white robes appeared before them and said, "Men of Galilee, why do you stand looking into Heaven? This Jesus, Who was taken up from you into Heaven, will come to earth in the same way (that is, in the flesh) as you saw Him go into heaven." After this the disciples of Jesus Christ returned to Jerusalem with great joy and stayed there together awaiting the descent of the Holy Spirit. All of them, together in soul, spent the time in prayer and were continually in the Temple of God praising and thanking God. With them, there were several women and Mary, the Most-holy Mother of the Lord Jesus Christ, with their relatives. In those days, the apostles prayerfully, by casting lots, chose from among the other disciples of Christ the twelfth apostle, Matthias, to take the place of Judas the betrayer, who perished. Ascended to Heaven, Jesus Christ according to His own promise invisibly always comes to earth among those who believe in Him, and He will come again to earth in a visible form to judge the living and the dead who will then rise from the dead. After this, the new life will begin, the life of the next age, another, eternal life, which for true believers and pious people will be completely blessed but for disbelievers and sinners will be a time of great torment. Thou didst ascend into glory, O Christ our God, having gladdened Thy disciples with the promise of the Holy Spirit; and they were assured by the blessing that Thou art the Son of God, the Redeemer of the world. ??????????? ???????? ????????? ?????????????, ? ??????? ???????? ???????????? ?? ??????? ? ?????????. ? ????????? ???? ????? ??????????? ?????? ?????? ??? ????????? ? ????? ????. ????? ??????? ?????? ?? ? ????????? ? ??? ?, ?????? : "??? ????????, ? ??? ????????? ?????????? ?????? ? ??????????? ?? ??????? ? ?????? ????; ? ??????????? ???? ?? ??? ??? ???????? ? ???????? ?????? ?? ???? ?????? ?, ??????? ? ??????????. ?? ?? ????????? ????. ????? ?? ????? ???? ? ???????????? ????????? (?????? ????????) ???? ?????. ??? ????? ???????? ? ???????? ?, ?????? ?????; ? ??? ?? ????? ??????? ?, ??????? ?????. ??????????? ?? ????? ???????????? ??? ???????? : ?????? ???? ????? ???????? ????? ; ????? ???????? ?????? ??????? ; ????? ????? ????, ? ???? ??? ???????????? ????? ?, ?? ????????? ?? ; ???????? ???? ?? ???????, ? ??? ????? ???????". ????? ????????? ?????? ??????? ?, ??? ????? ?????? ?? ??? ??????? ????; ? ?? ???? ??????? ??????? ?? ?? ??????????? ?? ??????????. ?? ?????? : "? ????? ?????????? ???? ????? ?? ??? ; ?? ?? ??????????? ? ?????? ????????? ?, ???? ?? ?????????? ????? ????? ; ??? ????? ??????? ?????, ? ?? ????? ????????? ???? ?????? ??????? ????? ??????". ??????? ? ???????? ?, ????????? ????? ?? ?? ?????? ? ??????? ?????? ?, ?? ???? ?????????. ?????? ?, ???????????? ??????? ???????? ?, ????????? ??? ? ????? ?????????? : "?? ? ??? ?? ???? ?, ?????? ?, ?????????????? ?? ??????? ????????" ????????? ?? ?????? ?? : "?? ???? ???? ????? ??????? ??? ???? ?, ??????? ???? ??????? ? ????? ??????. ?? ?? ??????? ??? ?, ????? ?????? ?? ??? ??? ??????, ? ?????? ????????????? ??? ??? ? ??????????, ? ?? ???? ????? ? ??????? ? ???? ?? ???? ?????". ?????? ?? ?, ????? ?????? ?, ?????? ???? ??? ?, ??????????? ???????? ?????; ? ????? ??????????? ?, ???? ?????????? ?? ??? ? ??????????? ?? ????, ? ????? ?????? ????? ??? ?? ???? ??. ??? ??????? ? ????????? ??? ????? ??????? ???????? ????????????? ????? ?? ?????? ? ??? ??????? (?? ?????? ???????) ???? ???? ????? ?, ?. ?. ??? ???????????? ???? ? ???? ??????? (????? ??) ????? ??????????? ? ????????? ???, ? ????????? ????? ?? ?????? ??? ? ????? ?? ???? ? ?????. ??????? ??????????? ???????????? ??????? ? ????? ?????????? ?????? ? ???????? ?? ???? ????? ???. ????? ??????? ????? ???? ??? ?????? ? ????? ??????? ? ??????? : "???? ???????????! ??? ?? ?????? ? ???????? ?? ????? ??? ???? ?, ??????????? ?? ??? ?? ??? ?, ????? ?????? (?? ?????) ????? ?? ??????? (?. ?. ?? ????? ???????????? ), ??? ?? ?????? ??? ?????????? ?? ????". ????? ????? ??????? ?????? ?????? ???????????? ? ????????? ? ??????? ???????? ? ?????????? ??? ??? ????? ?, ?????? ????????? ??????? ????. ??? ??? ?????????? ????????? ? ?????? ?, ?????? ?????? ? ????? ????? ?, ?????????? ? ????????? ????. ? ???? ???? ????????? ???? ? ????? ????????? ?????? ??????? ?????? ?????? ?? ?????? ??????????. ? ??? ??? ??????? ?, ?????????? ?, ??????? ?? ?????? ?? ?????? ???????? ????????? ???????????? ???????? ????? ?, ?? ????? ????????? ????-?????????. ?????????? ?? ??? ?, ????? ?????? ?, ?? ???????????? ??? ??????? ?, ???????? ?????? ????????? ?? ????? ????? ???????? ? ???? ? ????? ?????? ?? ????? ??????? ?????? ?, ????? ?????? ????? ? ?????? ?, ??????? ????? ??????????. ????? ???? ???????? ????? ???????? ??? ?, ?. ?. ????? ?, ?????? ???? ?, ??????? ??? ??????? ???????? ? ????????????? ????? ????? ?????? ?????????, ? ??? ?????????? ? ????????? ?????? ???????????. You are currently browsing the archives for the Ascension category.